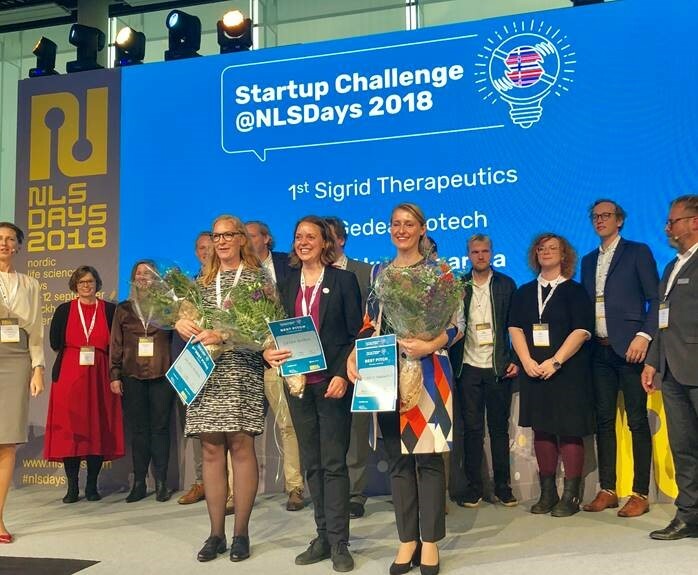 On 10th of September, Sigrid Therapeutics was voted the winner of the Startup Challenge Award at the Nordic Life Science Days. This is the largest partnering conference for the global life science industry in the Nordic countries. The startup challenge is an event showcasing the best and brightest startups currently emerging from the Nordic life science ecosystem. In May 2018, an expert jury selected 12 startups, based on their video contributions, to make a live pitch at the Nordic Life Science Days. “We are excited that the story of our lead product candidate SiPore15TM was received so enthusiastically by the audience of life science industry decision makers and investors. We look forward to presenting preliminary data from our second clinical trial at the Nordic Life Science Days in 2019”, says Sana Alajmovic, Co-Founder and CEO of Sigrid Therapeutics. Sigrid Therapeutics AB (Sigrid) is a Swedish clinical-stage biotechnology company pioneering a precisely engineered material, SiPore15TM, ingested orally and acting locally in the gut. The material is protected by filed IP and scaled up to GMP quality. Our lead product candidate is under development as a first-in-class ingested medical device targeting prediabetics and newly diagnosed type two diabetics. First in Man data indicates that SiPore15TM has a favorable safety profile and significant effects on blood sugar, blood lipids and body fat composition.